The advent of nanomedicine and near-infrared (NIR) optics allows the development and design of tools that enhance diagnosis and treatment of atherosclerosis. Clinical application of these technologies is anticipated in the near future. 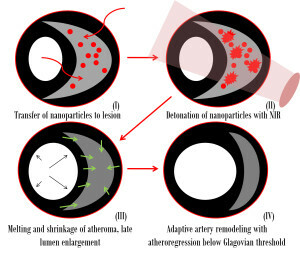 Our trial called NANOM-FIM was focused on the development of these approaches in interventional cardiology with the goal to destroy the atherosclerotic lesion and rejuvenate the vessel in hands of nanobiotechnologies. Fig. 1. A scheme of the plasmonic photothermal therapy of atherosclerosis. Panel schematically represents the main concept of the trial. Frame (I) shows the appearance of the advanced lesion before the intervention with the placement of the noble metal nanoparticles (NP) with either (a) the bioengineered on-artery patch which was grown with stem cells, or with (b) intravascular catheter and stem cells or microbubbles. Frame (II) demonstrates a detonation of NP inside the lesion with either (a) transcatheter near-infrared (NIR) high energy laser, or (b) with the out-body high-energy NIR device. Frame (III) documents a melting and shrinkage of atheroma with reduction of plaque burden and late lumen enlargement. Frame (IV) shows adaptive artery remodeling with the vessel healing, dramatic atheroregression and restoration of the artery geometry. Patients at the reported trial originated from Ural Institute of Cardiology (Yekaterinburg, Russia) in collaboration with De Haar Research Foundation (Rotterdam, The Netherlands) were examined at 12 months after the intervention in order to test two main nanotechniques (Fig. 1) with either (1) delivery of a 75-110 nm silica-gold nanoparticles (NP) in bioengineered on-artery patch (60 patients), or (2) delivery of a 90-150 nm silica-gold iron-bearing NP with targeted micro-bubbles and stem cells using magnetic navigation system (60 patients) versus stent implantation under protection of anti-platelet therapy. The NP irradiated with the NIR laser have a potential to demolish the tissue. The NP are able to form a cluster, and when excited with a short NIR laser pulse, act as a heat plasma source (with the nanoscale thermal detonation or explosion), thus generating an intracellular photothermal vapor bubble which causes essentially a kind of the burning (‘cooking’) or vaporization of cells. Optical and mechanical effects of the bubble can be controlled through the laser parameters to tune the bubble to diagnostic or therapeutic tasks. The procedure was successful and relatively safe in all patients. The atherosclerotic lesions degraded in all cases with a 44.8% reduction at the group with silica-gold NP, and a 43.2% demolition with iron-bearing NP. 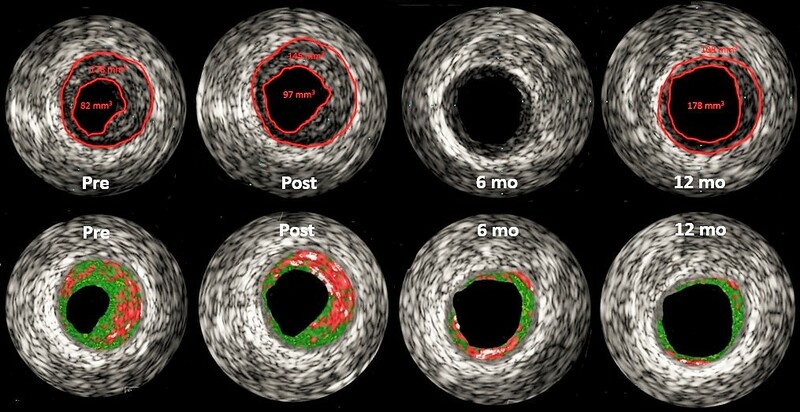 The intravascular ultrasound (IVUS) imaging analysis has shown (Fig. 2) the lumen enlargement with signs of proper endothelial recovery and progressive restoration of the injured artery wall. Actually, current interventional approaches using stents generally just manipulate the form of the plaque and has some clinical and technical limitations as well as relatively high complication rate. Moreover, it was feasible to achieve only 8.5-12.7% reduction of the atherosclerotic lesions after therapy with statin drugs or placement to the artery any stents and scaffolds, which makes our nanoapproach a dream remedy. 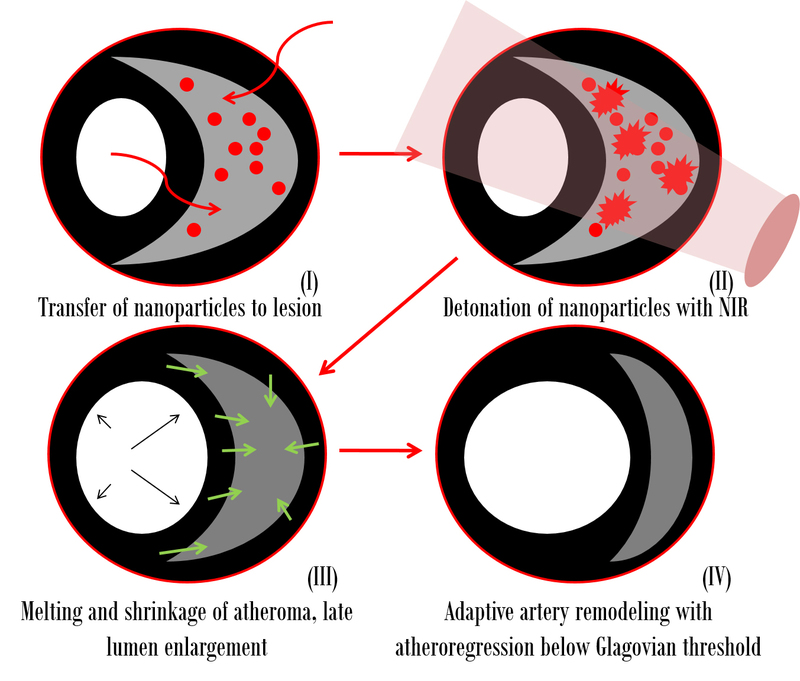 So, plasmonics with silica-gold NP offers a novel high-effective and safe ‘magic-bullet’ solution to conquer atherosclerosis as well as a potential of the HD-quality visualization of the coronary arteries. This way of the harmonization of the coronary artery disease management can replace the modern-day strategy with the implantation of stents and cardiac bypass surgery saving millions of lives and making our public health system cheaper. Fig. 2. Intravascular ultrasound (IVUS) results of the NANOM-FIM trial. Atheroregression becomes an attractive target for cardiovascular treatment. Proposed nanotechnology using silica-gold nanoparticles associated with a 30.7% (p less than 0.05) plaque burden reduction and significant lumen enlargement restoring blood flow in coronaries promising to revolutionize interventional cardiovascular biomedicine. There is certainly a room for the further research development at this field in order to optimize this approach for real clinical practice and realize theranostic potential of the technology revolutionizing interventional cardiology. The beneficial properties of silica-gold nanoparticles carry also a challenge to optimize NIR imaging with a potential to be used for NIR spectroscopy, angioplasty (analogous to excimer laser), nanoamplification of any imaging modalities, and activation or detonation of nanoparticles for plasmonic photothermal therapy of atherosclerosis nothing to talk about a potential of this technology for the ultimate dream device so called electronic stents or scaffolds where bioresorbable attitudes combined with the novel imaging techniques, plasmonics and sensors. Dr. Alexander N. Kharlamov, M.D. Silica-gold nanoparticles for atheroprotective management of plaques: results of the NANOM-FIM trial. Kharlamov AN, Tyurnina AE, Veselova VS, Kovtun OP, Shur VY, Gabinsky JL.